The concept of repentance (tawba in Arabic) is key for the Islamic State (IS) whenever it takes over a new area and aims to consolidate control. Whoever undergoes repentance under IS successfully is issued a repentance ID document that stipulates the person has abandoned his/her apostasy and is to be treated like the rest of the Muslim populace under IS rule (Specimen 3V). The repentance process has two main applications. First, it is used to subdue people who had been affliated with rival forces primarily through the quid pro quo principle of sparing one's life in exchange for surrendering all weapons to IS. This generally includes members of Syrian rebel groups, Sunni conscripts to the Syrian army, and members of the Iraqi army and police. For a sample case, see Specimen 1B in the archive of IS admin documents with the case of the Albukamal area in Syria. At times, IS has faced agitation against its rule from those who had repented, such as in the Fallujah area, which led to the tightening of repentance conditions last year (Specimen 6Q). Repentance is also important for co-opting existing administrative structures as far as possible into IS governance, as many who repent will have worked in jobs that cannot be applied to the IS system and so will be left without actual work (leaving aside salary payments for the moment). Most notable with regards to co-optation within the strictures of IS governance is the attempt to bring the Iraqi and Syrian education systems in areas of IS control in line with IS ideology, which entails securing the repentance of teachers and education admin staff and then subjecting them to 're-education' in the form of Shari'a lessons, using IS textbooks like al-Taqrirat al-Mufida fi Aham Abwab al-Aqida (Beneficial Courses in the Most Important Aspects of Doctrine). Section from the aforementioned textbook denouncing Ba'athism. My brothers, by God I do not have anything to do with these matters. I am only a Muslim servant of God. Trust me, I convey all your sufferings and spare no effort in that. And God is the guarantor of success. There is no Lord but He." Notably, this post was subsequently deleted. 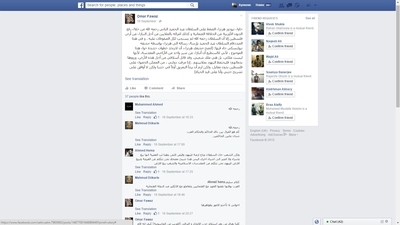 As of the time of writing the account remains on Facebook but the profile picture of Fawaz has been removed, with occasional posts concerning Islamic history and theology (undoubtedly in an attempt to come across as a learned individual) while content directly touching on the Islamic State is kept to a minimum. Other posts prior in date to the one above on repentance also concern history and theology. Some samples below. Meanwhile, a Twitter account calling itself "Adam Adam" (suspected in anti-IS Mosul social media of being a pseudonym for Fawaz: here the account itself says it is indeed Omar Fawaz) has largely ceased tweeting since early September. 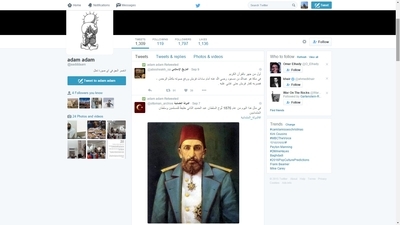 Similar to the Facebook account, the Twitter account displays an interest in Islamic history. At the same time, the pro-IS orientations of both accounts are apparent. 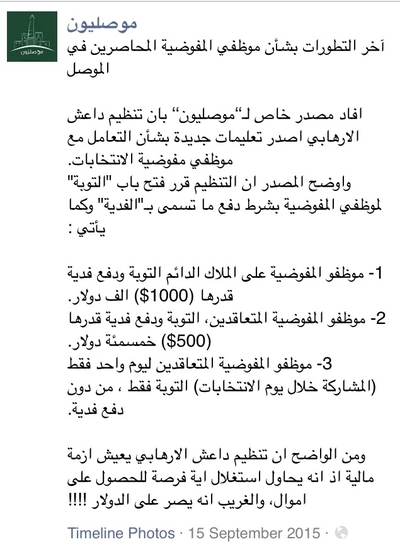 In the only other post directly touching on IS on the Facebook account, a request is made for verification of claims of govt forces advancing in the Baiji area, as rumours have apparently spread among people in Mosul that "members of our state [IS] have fled from Baiji." 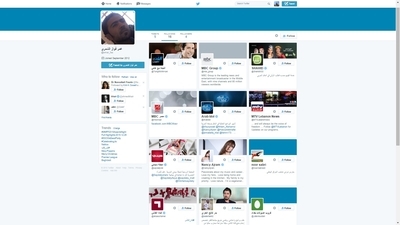 As for the Twitter account, an overview of the tweets it "likes" points to an account that remains favourable to IS. Based on the similarities between the two accounts, it is most reasonable to conclude that both accounts are being run by the same person: namely, Fawaz himself. 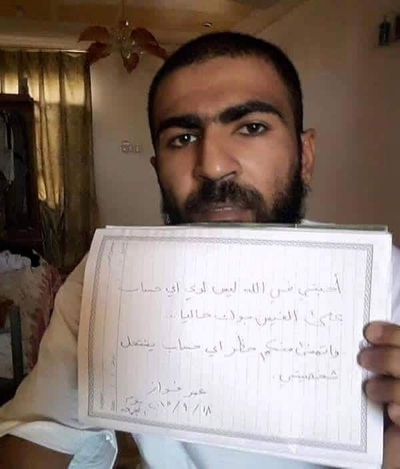 This is so despite a report in early September claiming he was executed by IS and a photo circulated in anti-IS Maslawi social media that purportedly shows him holding a placard dated 18 September, saying he has no Facebook account at the present time (as below). In short, Fawaz has ceased to be the prolific source on IS he once was. 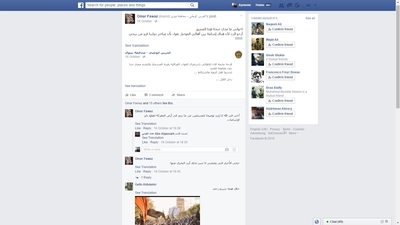 His descent into obscurity may reflect more restrictive IS policies on members and supporters' use of the Internet and social media to broadcast information about IS outside the official media channels. The deletion of the original post on IS repentance fees is quite telling and would seem to undermine the idea the Facebook account is fake: rather he may have crossed the line for the final time and now must be very careful. Despite his orientation, he posted some quite valuable information and it may be that IS authorities came to perceive some of his posts, even if well-intentioned, as detrimental. 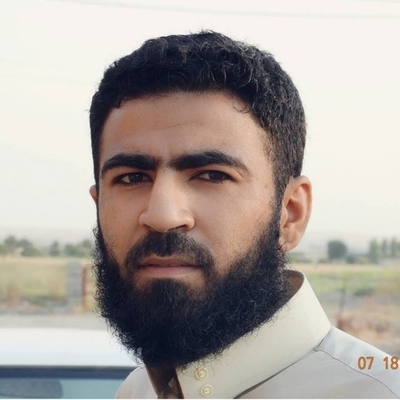 "Omar Fawaz al-Shammary from the city of Mosul lives in al-Mazari' neighbourhood and is a graduate of technical engineering from Mosul University as well. In the days of university, he called himself Omar the poet or Omar al-Shammary, of vile manners and despised by the majority of his colleagues for his despicable conduct and his depravity in dealing with people. In the last elections, he began spouting words of zealotry calling on people to vote for the Muttahidun lil-Islah list headed by Osama al-Nujaifi. For that he received a respectable sum of money and he was sent to Japan as he was sent via the province [provincial funds] for a time. Omouri Mustabeh left Mosul after its fall for Dohuk and from Dohuk he went to Turkey. And for a time he waged a media war against the organization and he called to fight it. 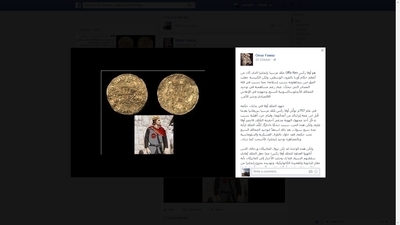 But then he changed suddenly and not only began advocating for the land of the Caliphate but also recruited a number of fighters, including a young man from Samarra he recruited and sent from Turkey to Raqqa and then from Raqqa to Iraq." Of course, after his apparent 180-degree turn to support IS, he eventually returned from Turkey to Mosul. 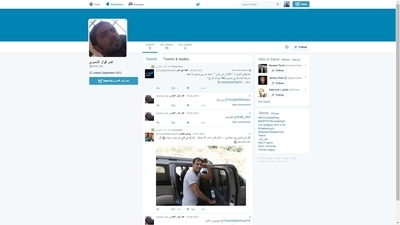 Interestingly, it appears that prior to the fall of Mosul, he had a Twitter account under the name of Omar Fawaz al-Shammary with the Twitter handle of @omar_faz. Minus the beard, the photo is unmistakably that of Omar Fawaz. 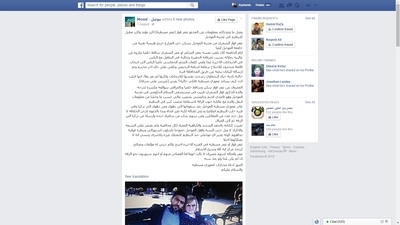 From the account, it is clear he was a fan of the TV show Arab Idol, Lebanese pop star Nancy Ajram, and famous Iraqi national football player Younis Mahmoud. 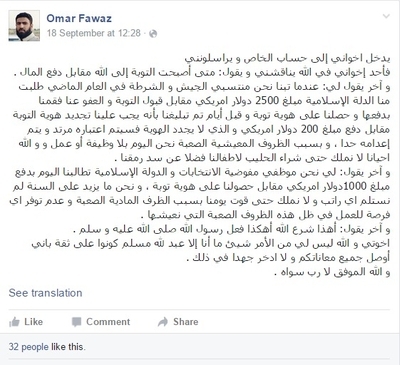 Though some of the information presented in the biography should be treated with a degree of caution, it does appear that Omar Fawaz represents a rather interesting 'radicalization' case. - Contracted for one day only (i.e. participation only on the day of the election): repentance without paying a fee.
. In December 2015, Mosul Eye affirmed that in Mosul, every police officer who has repented (or otherwise been executed) since the beginning of Islamic State control of the city has paid $2000.
. 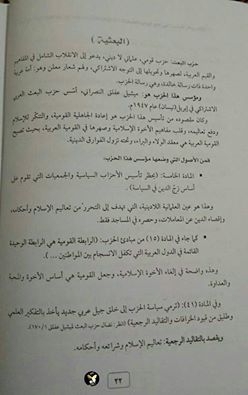 In June 2014, al-Masalah cited local sources reporting that each security apparatus officer had to pay 1,000,000 Iraqi dinars (c. $900) and hand over his weapons for repentance. By September 2014, al-Akhbariya News Agency put the required sum for ex-security personnel at $2000 or a Glock pistol as part of the completion of the repentance processes. Thus it seems the initial sums demanded were raised over time. Update (29 March 2016): I corresponded with Fawaz's Twitter account. He denies that the Facebook account is his and says he does not know whether repentance has involved paying financial sums. In addition, he mentions that he has abandoned media work, reflecting the IS policy of keeping the broadcast of information to its own authorized channels. I leave all the material above for the interest of the reader.